Discussion in 'iPhone and iPad Games' started by sonofnab, Dec 2, 2016. Would be great to know your first impressions based upon how its presented, what you think it offers etc. If you drop a few thoughts below, ill be sure to repay you for your time with a PromoCode so you can go on and try it out for yourself! (prob limit it to 10 for now). Not interested in a code but have some thoughts anyway? No worries, always happy to hear what people have to say even if its a rant at how utterly appalled by it all they are. A new and exciting twist on the classic beat matching formula, will MEMORY or RHYTHM be your downfall? Answer: could be both! 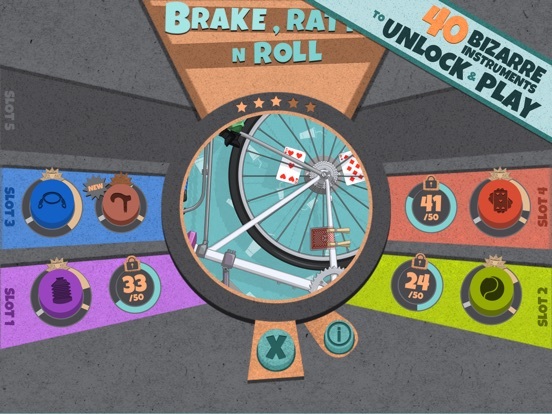 This game is for fans of that 'one more go' philosophy, whilst natural ability may come in handy, you’ll never beat all 5 stages if you don’t hone and develop those skills… so listen up, let the rhythm take hold, and get tapping to that beat! 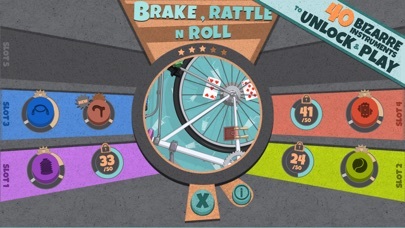 Features:- o HAND CRAFTED STAGES - Each stage has been carefully designed to provide challenge and fun in equal measure! Difficulty increases as you progress, and the strange make-up of each stage means part of the fun is in seeing what comes next! o UNIQUE MUSICAL INSTRUMENTS (40+) - A bizarre collection of instruments waiting to be unlocked and used. What sound does a Rubber Chicken make when squeezed by a vice? That and more will be revealed! o VARIATION ON PLAY - Time pressures, tempo changes, sequence lengths, instrument numbers… they’re all played with to mix up how you play! There’s even a bit of challenge free fun to be had at the titles screen ‘Jamming Out’. o HANDICAPS AND CHALLENGES - With SEVEN musical based handicaps introduced alongside the general changes during play, there’s plenty to keep you on your toes. 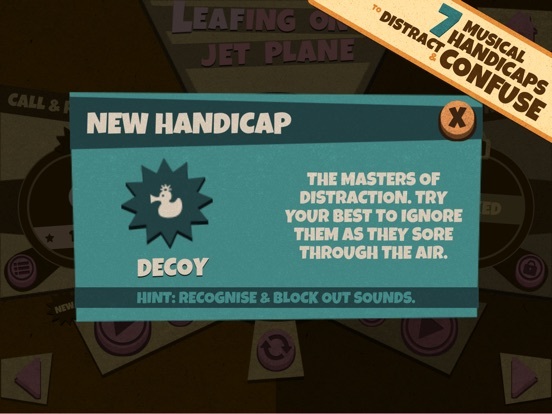 Will you fall victim to the Decoy? o ACHIEVEMENTS AND LEADERBOARDS - Battle your way to the top of the leaderboards, hitting high-scores targets and being graded as your progress. Complete additional achievements and unlock new content to play with on the titles screen. Integrated with Game Center as standard. o AUDIO FOCUS - Ears and eyes are just as vital here, so let those ears take some of the strain! Headphones (although not necessary) will enhance the experience and give you that bit of an advantage. Hopefully you’ll have an enjoyable experience playing the game, but if you do notice any issues or simply have something to say, please do get in touch and/or follow sherpa reynolds at the relevant channels. All the best, son. First impressions after 20 minutes - I'm bordering on the mildly appalled. 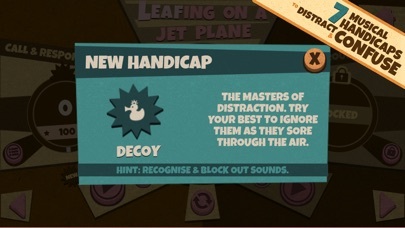 At the start of play there is a half-second lag between screen tap and sound which makes timekeeping impossible. It seems like this delay is caused by the sound samples being loaded, as the delay disappears after the first few taps, but it's still not a good start. 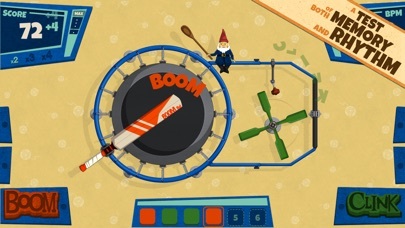 The gnome puts me off as the sound and visual of his hitting the metal ring seems out of synch. Then, on a personal note, the metronome is too low pitch for me. The frequency merges with those of the drum and bottle making it diffucult to hit the beats, so I would appreciate the option of a traditional high pitch 'click' sound. In the meantime I'll stick with it and try to complete Air on a G Spring. Oh damn... sorry to hear that Stronsay. I would say that's fair comment to be mildly appalled by that! Do you mind me asking what device you're using? It has been extensively tested on iPhones 4S and up and aside from an occasional lag on the 4S upon first play I haven't experienced any out of sync beats etc. Again, sorry your initial impressions haven't been great. Hi sonofnab. I'm using iPad 4 iOS 10.1.1. The lag only occurs on first play as you mention. OK after that. I guess I can work through it. 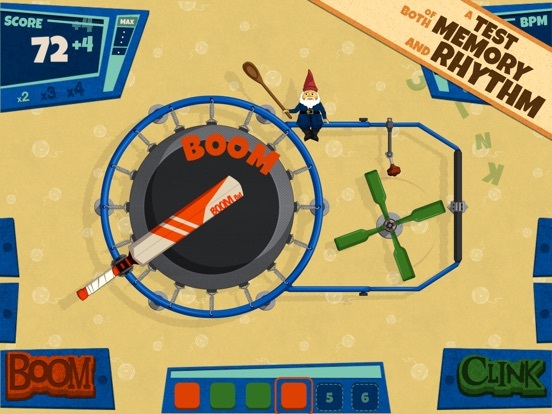 The 'metrongnome' issue is more a visual thing. Sound doesn't match when he hits the ring, but the beat timing is actually correct. It's fine as long as I don't look at him! I'll progress further to hear the other timing effects. At present I'm slightly ahead of you on the 'round repeat' chart. Ha! Fair play, can't be doing too bad then Cheers for the info, I have struggled to narrow down what causes it on the 4S, it really doesn't make sense why it does it on that first play and not others but I'm going to try my best to optimise some more and stamp it out entirely for future versions. One of the goals of the game was to get people to focus on using their ears a bit more, rather than overly rely on visual cues but I understand that must be off putting, so again will look to rectify it. Well here's a thing; I was afraid to press the button with the dustbin icon in case it deleted all my progress. I've since figured out that it's another percussion instrument! Along with the ship's wheel. That's a new one on me. I gave this a go in the first place due to being a rhythm junkie. My other hobby is playing in a jazz band. Probably why I need a higher pitched gnome sound. Give him some snares and brushes. For a second I thought it was called 'finger bang'. Doesn't work. Playing on iPad Pro with latest iOS. Sorry, needs major fixing. Requesting refund. Well, so much for that! Guess I'll wait and see if they update this and if they do and there's no issues, I might pick this up then, but for now, I'm holding off! I've now seen this app running on an iPad Air 2 where it works perfectly. No delays anywhere and metro-gnome is in synch. Hey Pluto6, any chance you could expand a little on what isn't working for you? I'm just trying to get to the bottom of what the issues might be, especially on a newer device, that really doesn't make any sense to me. I see you've managed to score some points, so i'm guessing you can play the game, but where is it faltering? Also, great news that you've managed to play it on another device, I hope you can enjoy it a bit more now! I've been able to spend some time on iPad Air and it's like a different app. So much easier to play and I no longer have trouble with the sounds or timing. I'm regularly hitting 4x combos so it's a lot more fun. I picked up on the jazz vibe of course, and I'm all in favour of alternative percussion instruments. This is taken to another level with the stretched tie, umbrella and squeaky tyre, and I'm trying not to be put off by the false teeth. I'll have to get some of these into the band! 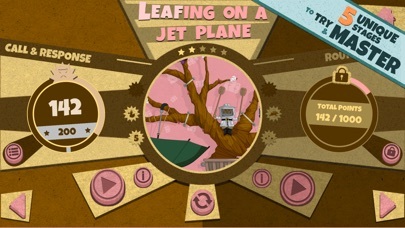 I note that the visual cues ceased during Jet Plane forcing me to play by ear. Good move that. Can't wait to have more instruments added. 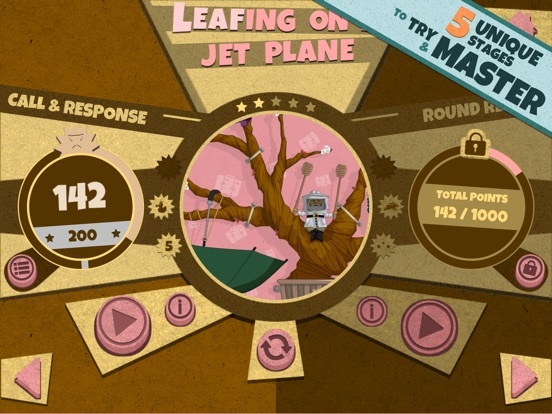 I've got as far as I'm likely to get now - 265 points on Jet Plane call & response mode. The reason is the occasional background sounds which sometimes obliterate the percussion sounds I'm trying memorize. Can't hear them at all so I end up guessing. With 3 possible instruments the odds are in favour of guessing wrongly. I get the impression this is deliberate to add difficulty which it sure does. After numerous attempts I have to admit defeat. Excellent update. Running very smoothly now and also works much better on the Ipad 4. I see various other feedbacks implemented which are useful. I have already made further progress. It's been a little while longer than planned, but Finger Band will be getting a significant update tonight/tomorrow, when it transitions into v1.2!